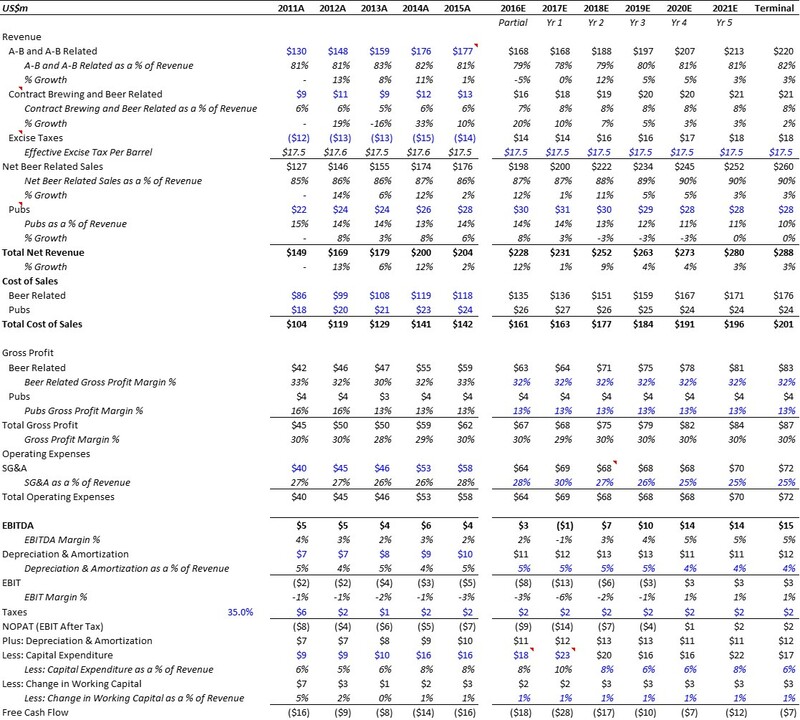 After accounting for capex and likely scenarios in each year of their production and sales, Craft Brew’s valuation doesn’t look very appealing. Craft Brew was an incumbent in the recent craft brewery trend but is now struggling as this trendy niche has now become an oversaturated mainstream market. Can Craft Brew survive the influx of competition into this niche space? Resignation Brewery (through theCHIVE.com) – first ever virtual brewery through an online media platform. The original CEO from the merger, Terry Michaelson, transitioned out of the role in 2013 but has stayed on as a senior advisor. The CEO that took his place, Andy Thomas, has been with CBA since 2011. CBA distributes to retailers through wholesalers in the Annheuser-Busch network, and more than 90% of their sales comes from this channel. Breweries Association reported that in Dec 2015, the number of breweries in the US surpassed the previous record in 1873 with 4,144 breweries, many of which came online in the recent part of the decade. 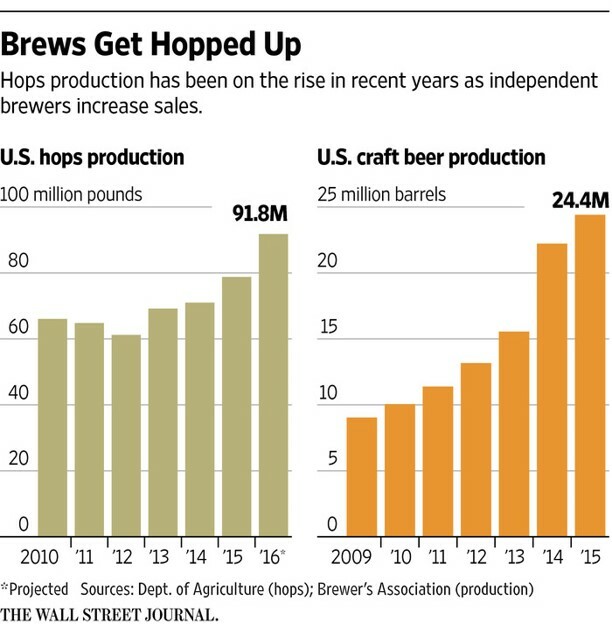 But, craft brew supply has now reached the demand and will likely start to see a plateau. The overall volume shipment of barrels has decreased in the last 2 years since 2014 because of declining popularity of Widmer and Redhook brands. Therefore, a similar level of draft to packaged goods ratio and therefore a similar level of average selling price per barrel are assumed in deriving revenue. I believe that with the expansions and greater marketing efforts to rebrand their dying brands, SG&A spend will increase in 2017 over budget. Then, they could see losses and in 2018, initiate a cost-reducing strategy, which will drive the SG&A back down to slightly below normalized levels going forward. Capex in FY2016 was estimated to be between $17-$19 million as reported in their recent quarterly. Capex of $20 million is expected to expand Kona brewery in 2017. Assumed conservatively for other brewery improvements to be only an additional $3 million. The Company has been operating with a negative free cash flow. Widmer and Redhook brands have been around for a long time, but they never gained popularity outside of the Pacific North West (and a bit of lower West Coast). With a crazy influx of craft breweries in the last decade with local brands winning the hearts of beer fans in their communities, older brands just can’t keep up with the competition. Kona at least brings something unique, because it comes from “overseas,” so it could maintain some traction. And, CBA was smart to introduce Omission and Square Mile – something unique to the table. Continuing to introduce innovative products will be key to survival. It is slightly of concern that Annheuser-Busch is CBA’s exclusive distributor and that over 90% of their sales come from this partnership. But, it is not too alarming, because that’s just the nature of the business, and it is unlikely that A-B will suddenly raise their fees to ridiculous levels. CBA’s capex levels have been pretty high and their expansion of the breweries for ~$20million a piece seems egregious. Their opportunity to fill the new increased capacity will come from increasing their international sales efforts and if they acquire or introduce a new unique brand. Could we see CBA dismember their alliance of brands and either (1) operate as a lean company of one or two brands or (2) divest their underperforming breweries and position their more popular brands to be acquired by large brew companies like Boston Beer?